Autophagy plays diverse roles in cellular adaptation to stress and promotes vital housekeeping functions by recycling unused or damaged organelles and proteins. 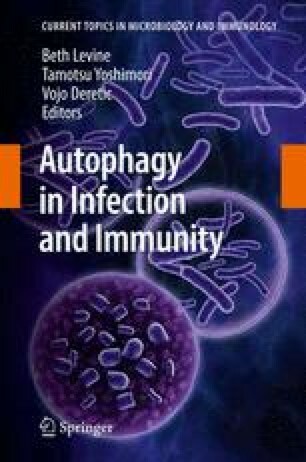 As an innate immune defense pathway, autophagy also protects against infection with diverse pathogens, including viruses. Autophagy combats infections with both RNA and DNA viruses, and may function by degrading viral components, by promoting the survival of virally infected cells, and/or by activating innate and adaptive immunity. Viruses have evolved counter-mechanisms to evade host autophagy in order to promote their own survival. This chapter will highlight recent advances and unanswered questions relating to autophagy in mammalian antiviral immunity. We apologize to authors whose work could not be included due to space restrictions. We thank Deborah Shaw for administrative support. The work in the authors’ laboratory was supported by NIH grants R01 A10151367 (B.L.) and T32 A1007520 (A.O), and an Ellison Medical Foundation Senior Scholars Award in Infectious Diseases (B.L. ).